"There is only one way to kill a cat and indeed to all animals and this is humane slaughter." Whereas the fate of big cats, elephants, primates, and other endangered and abused animals justifiably garners widespread attention from conservationists around the world, little attention is paid as to how companion and farm animals are treated on the "Dark Continent." It therefore is difficult to gauge from afar whether the shocking manner in which this particular cat was abused is indicative of how most cats in Ghana are treated or whether this is merely as isolated case of moral degenerates seeking worldwide acclaim. The photograph was posted online by someone who calls himself Kwabina Daniels, a.k.a. Popkon Sika-one. He possibly could be one of the youths shown in the photo but even that has been called into question by the Ghana Society for the Protection and Care of Animals' (GSPCA) plea for the public's assistance in identifying those pictured. "To Facebookers and friends of the supposed perpetrator of this cruel act, it was fun and perhaps the most award-winning picture," David Nyoagbe and Amasaba Adul-Yakeen Aluizah of the GSPCA said in a joint statement released to the Ghana News Agency (GNA) on October 5th. 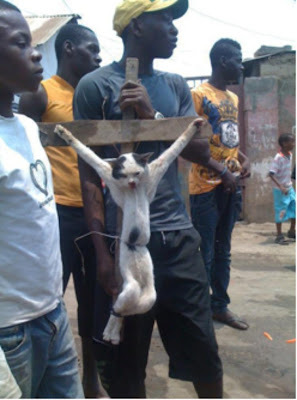 (See "Society for Animal Protection Decries Crucifixion of a Cat.") "It took friends of animals all over the world who begun (sic) criticizing this dastardly act for the picture on (the) Facebook page to be taken off." To its credit, the GSPCA promptly condemned the killing and even went so far as to add that cats should be fed regularly, provided with veterinary care and sufficient space in which to exercise, and not be subjected to either threats or molestation. Beyond that, however, its position is a good deal more ambiguous. For starters, the organization categorically states that it does not object to the use of animals for food, farm work, security, and in sports. Rather, its only concern is that when an animal is to be killed that the Islamic (and Jewish) tradition of slitting its throat be followed. "There is only one way to kill a cat and indeed to all animals and this is humane slaughter," Nyoagbe and Aluizah avowed to GNA in the article cited supra. On the surface, that admission seems to negate not only what the GSPCA has to say about proper cat care but leaves open the possibility that it approves of the odious Ghanaian practice of consuming feline flesh. After all, there could not be any valid reason for slaughtering cats in the Islamic tradition except to consume their flesh. If that were not the accepted practice in Ghana, the GSPCA surely would have issued a blanket condemnation of the torture and killing of cats under all circumstances. The GSPCA concluded by accusing the youths of insulting Christianity. "If this is not blasphemy, then what is?" it plaintively asked in the GNA article cited supra. For whatever it is worth, the CIA World Factbook claims that nearly sixty-eight per cent of Ghanaians profess to the Christians as opposed to only sixteen per cent who claim to be Muslims. It therefore is conceivable that this totally innocent cat became a pawn in the age-old conflict between these two mutually antagonistic and bloodthirsty rivals. The dates on the calendar and the geographic location may have changed but that does not make what was done to this cat any less hideous and unjust. The same logic is equally applicable to the eating of cats. Due to the elliptical nature of the GNA's reporting, it is not known either where the crucifixion occurred or if any halfway serious attempt is being made to bring those responsible to justice. More than likely, little or nothing is being done because the GSPCA seems to be more concerned with the youths "for dragging Ghana's reputation to scorn in the face of international animal lovers and organizations" than with apprehending them. That is not only wrongheaded but shortsighted as well. Ghanaian authorities can best repair the damage done to their nation's reputation by acting swiftly to identify and arrest those responsible. Although the gory details have not been disclosed, this totally innocent and defenseless cat was corralled and tortured, most likely over an extended period of time, and then nailed to a cross. Unlike with Jesus however, no miraculous resurrection is expected. Even more alarming, the barbaric practice of crucifying cats cannot be blamed on either a lack of education, the backwardness of a nation, or an absence of anti-cruelty statutes. That assessment is vouched for by its persistence in the so-called enlightened West. For instance on April 5, 2010, Andrea Bristol was on her way home to tiny Geneseo in rural northwest Illinois when on Ropp Road near Dutch Bottom Road she spotted what she auf den ersten Blick mistook for a raccoon stuck to a utility pole. Once she pulled over to investigate, she was sickened by what she discovered. "It was a cat, and a nail had been pounded through its hind foot," she related to the Geneseo Republic on April 6, 2010. (See "Cat Found Tortured, Nailed to Pole.") "I couldn't believe what I was seeing. I kept trying to tell myself that maybe it had just gotten caught but, no, the nail was pounded right through its foot." As it later was to be revealed, the nail in his foot was the least of his injuries. "There was blood coming from its mouth and hair was missing, like it had been beaten up." An Animal Control officer from Henry County arrived on the scene and used something akin to a wrecking bar in order to pry the striped male American Shorthair from the pole. It is a small wonder that thoroughly beastly act did not finish off the cat on the spot. A far less painful alternative would have been to use a saw and chisel in order to have separated the nail from the pole. Surgeons later on could have removed the nail while the cat was under sedation. "Breaks your heart," Miller told WQAD-TV of Moline on April 6, 2010. (See "Cat Found Nailed to Post.") "You just wonder why?" Miller bandaged Dutch's paw and placed him on intravenous fluids and, although he initially was given only a fifty per cent chance of making it, he rallied gallantly and by April 7th the veterinarians had upgraded his prospects to eighty per cent. In fact, by that time he was purring again and leaping into the arms of his caregivers. Sadly, he was unable to sustain the momentum that he had built up over the course of the previous forty-eight hours and died unexpectedly either later that night or early the next morning. As things eventually turned out, the blood that he shed on the utility pole outlasted him by about a day in that it was still visible for up to a day after his death. Since neither Miller nor the media have speculated on the cause of Dutch's sudden reversal of fortunes, it is impossible to say what went so terribly wrong. The fact that veterinary personnel were unable to pinpoint the exact time of his death is a strong indication, however, that he received lax care. If that indeed were the case, it constitutes the very epitome of veterinary malpractice. Any animal that has suffered injuries of the magnitude of Dutch should have been kept in intensive care with a veterinarian monitoring his progress twenty-four-hours a day. It is highly unlikely that practicing physicians and hospital personnel would be allowed to get away with dispensing such slaphappy treatment and veterinarians and humane groups should not be allowed to do so either. When an animal's life is hanging in the balance, minimalist care and hoping for the best are woefully inadequate. Dutch's horrific abuse and cold-blooded murder sparked outrage all around the globe but no one felt it more than Bristol. "How could anyone do this to an animal?" she rhetorically asked the readers of the Geneseo Republic in the article cited supra. "When it happened, I was so upset, but the next day, I was very mad. I wanted to tell everyone I know in hopes that someone would know something and help this end in justice." Concern and outrage do not solve feline murder cases, however; only sound detective work can achieve that objective. As a consequence, Dutch's killer is still at large in Geneseo and, no doubt, abusing other cats. A Facebook page entitled "Justice for Dutch" was set up shortly after his death but it has not been recently updated and apparently is not playing any role in helping to bring his attacker to justice. Both Carl Vincent, a psychologist with Southpark Psychology in Moline, and Richard Hutchinson, a clinical psychologist with the Child and Family Psychology Center in Moline, believe that Dutch's assailants were adolescent teens. They base that assessment, in part, on the brazenness of the crime. "(They put the cat) someplace they knew it would be seen," Hutchinson told The Dispatch of Moline on April 7, 2010. 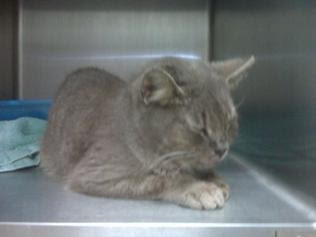 (See "Update: The Cat Nailed to a Pole in Henry County Died Overnight.") "In some ways they're thumbing their nose (sic) at all of us...They want that attention without the responsibility." Hutchinson's opinion is buttressed by the fact that Dutch was found crucified the day after Easter. Although it is not known how long he was on the pole before Bristol discovered him, the crime itself is, like the crucifixion in Ghana, another blatant slap in the face of all Christians. Dutch's horrible death was made all the more heartbreaking because he already was a cat well-acquainted with misfortune. For instance, he apparently enjoyed an extremely close relationship with his previous owner until that person recently died. He then apparently wound up on the street although area resident Lester Forbes continued to feed him. "It's so cruel," he told WQAD-TV in the article cited supra. "We're supposed to take care of our animals, not abuse them." As it is so often the case, Dutch's domestication made him an easy target for the person or persons who killed him. More than likely he did not suspect a thing until it already was too late. The only positive development to come out of this sickening and infuriating act of animal cruelty was the creation of the Dutch Memorial Fund by the Geneseo Chapter of the Henry County Humane Society (HCHS). Established with surplus contributions that originally were made for Dutch's treatment, the Fund since has helped to save the lives of more than two dozen animals. In particular, it has paid for leg amputations for two kittens named Tammy and Darlene. It also has been used to finance eye removals for Roamer and Cabela. "All four of these unique kittens are very playful. They have adapted to their losses and are living life like they should," Cindy Avey of HCHS told the Geneseo Republic on October 28, 2010. 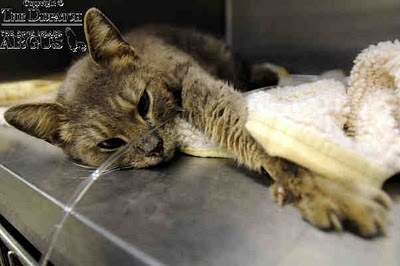 (See "Dutch Fund Helps Injured Kittens.") "I think if you told them there was something wrong with them or that they were different, they would look at you like, 'What are you talking about'?" So, in a manner of speaking, Dutch's indomitable spirit lives on in each of the kittens as well as in the other cats that have been helped by the fund that bears his name. "The Dutch Fund made all the difference in the world for these kittens," Avey concluded. The cold-blooded and remorseless executions of Dutch and the forever nameless cat in Ghana once again vividly have demonstrated the extraordinary lengths that enemies of the species are prepared to go in order to achieve their objectives. The method of mutilation in each case also tends to indicate that the perpetrators could be pursuing agendas that have far wider societal implications than merely killing cats. Even without imputing any ulterior motives to their killers, the loss of these two innocent lives is tragic enough in its own right. The pain that they were forced to endure could not have been anything short of excruciating and seemingly interminable. Frightened out of their wits and with all conceivable avenues of escape closed off to them, their helplessness and anguished cries served only to stoke the fires of their persecutors' runaway and malignant egotism. It is precisely for individuals of this sort that sure and swift justice in the form of capital punishment is merited. The sooner that societies resolve to eliminate this type of human filth, regardless of their ages, the better off that both animals and mankind are going to be in the long run. Photos: GNA (crucified cat), The Dispatch (Dutch underneath blanket), and the Geneseo Republic (Dutch with eyes closed).